Time Warp Mode engaged! Friday, December 5, 2014 – Fantastic Forum got its start on DCTV in Washington, DC. While there are numerous stations that carry the program today it all began at the Brooks Mansion HQ of DCTV. 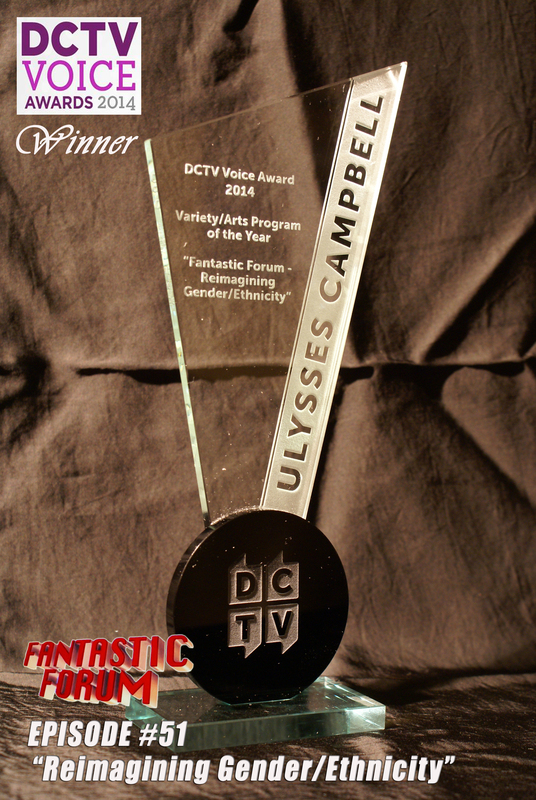 We’ve been fortunate enough to take home a DCTV Viewer’s Choice Award in the past. This one carries a bit more weight as it is purely merit based. An independent panel of television professionals judges each entry. FF received the honor of Best Variety/Arts Program of the Year. This award would not have been possible without the dedication and talents of the fine panelists and crew who have volunteered their time and abilities to this project. With them there is no Fantastic Forum. Each and every one who has participated and contributed to the show shares in this recognition. Thank you! ← VA Comicon and the FF Podcast!